■ Location : Home > NEWS > Lord Fin Tube--What are the contents of the welding of spiral fin tube? Lord Fin Tube--What are the contents of the welding of spiral fin tube? The welding of spiral finned tube is usually used in high frequency welding, which contains what knowledge? What can we learn from this knowledge? For people who want to understand the knowledge of the fin and tube, in the learning process, but also to think about the problem. Below, we will come to understand, for reference purposes only. With high frequency current as heat source, the contact surface and the weld zone are heated, and the top of the outside of the fin tube is applied to realize the solid phase welding of the contact surface. (1) the surface of the pipe can not have obvious pits, the removal of oil, rust, rust and other dirt. (2) the preparation of the top forged wheel shall ensure that the clip on the strip is appropriate in the circumferential direction, and is uniform, and the inner member can rotate freely. (3) the welding between the electrodes and the contact shall be firm and reliable, and the cooling is smooth and no leakage is. Such as Q/SH.MM.25 - 2000 including welding joint tensile strength, bonding rate and so on. These parameters indicators must meet the standards prescribed by the state. Appearance check: after welding, the appearance of the examination, the results of the examination should meet the standard requirements. 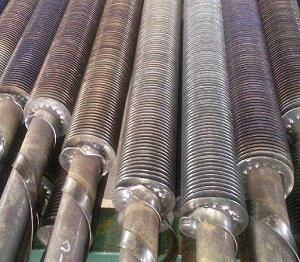 Bonding rate examination: the finned tube ripping out two to three turns, every 120 degree examination time, with nominal thickness of the actual weld divided by the width of the steel strip can be obtained by bonding rate. Metallographic examination: from the joint surface, is not completely normalized structure and normalized structure, check without inclusion, fusion and macro defects such as cracks. High frequency welding is a welding technology, there are two kinds of induction welding and contact resistance welding. Solid plastic pressure welding - the edge of the tube billet heating to 1300 degrees Celsius, the plastic state at 1350, and then under the pressure of the pressure of the roller to the oxide film extrusion, at the same time, through the high temperature to make both sides of the edge welded together, the compression strength of more than 40 - 50MPa. Semi molten welding - heat the edge of the tube into the semi molten state, through the extrusion roll extrusion, the extrusion of the liquid film extrusion, and complete welding, the extrusion strength of the general 20 - 30MPa. Fusion welding -- the tube billet edge transition zone heating to the melting state, welding temperature is more than 1400 DEG C, at this time a portion of a molten metal gasification, and then through the extrusion and extrusion, periodic spark splash in the whole liquid overlapping zone extrusion strength and semi fusion welding is connected to.